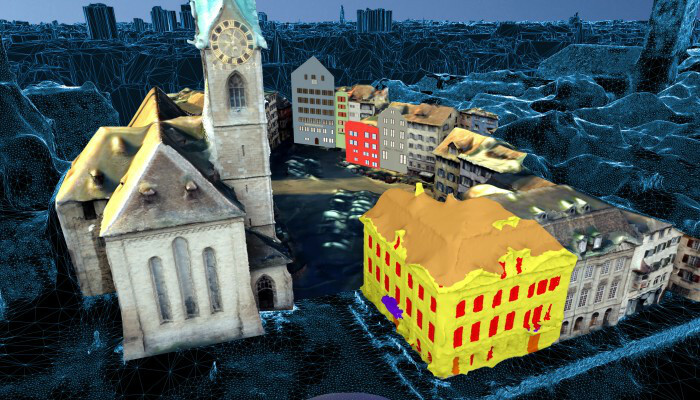 We live in a world where we try to teach computers to make sense of they see, but in some cases, they can make better sense of visual data than us, as VarCity demonstrates by creating a 3D city based on photos and videos. Nowadays we can find photos of almost every corner of a city (not to mention videos). If we add official sources such as traffic cameras and surveillance cameras, we have a generous amount of data that can be compiled to recreate the entire city in 3D - as demonstrated by this VarCity. The project is somewhat similar to what MS already showed us almost a decade ago with its Photosynth project, but here with added interest to urban planning and city management. For example, with this information the system can estimate the number of windows on each building and their size, which together with the 3D information will allow to evaluate levels of solar exposure, among other things; as well as analyzing traffic flows and pedestrians (based on the cameras). ... Considering the increase in the amount of photos and videos each year, whether from photos publicly shared on the internet, or captured by future autonomous vehicles, and this sort of technology will become a must-have to take full advantage of all this information.